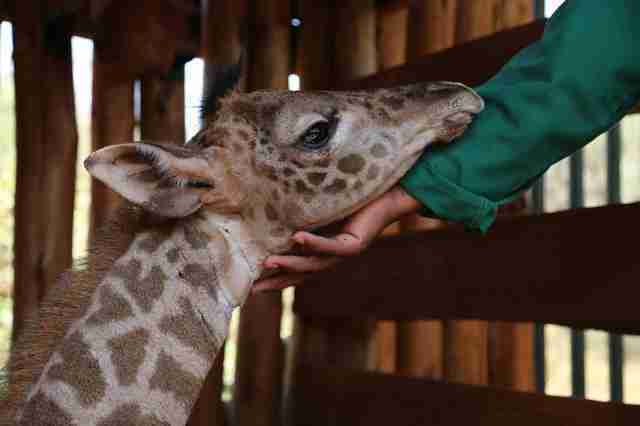 Last month, we rescued orphaned Masai Giraffe, Kili. 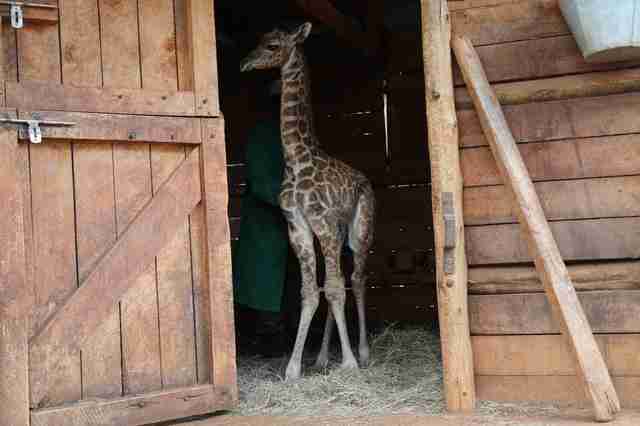 Already he's begun to dwarf our team of carers, not all that surprising when you consider that giraffes are the world's tallest land mammal. But there is a whole host of other surprising giraffe facts Kili can teach us. 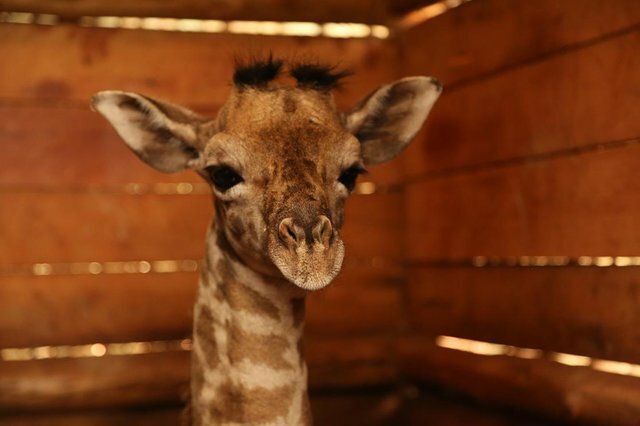 Motherless and alone, orphaned giraffe ‘Kili' was rescued in the foothills of Mount Kilimanjaro by Kenya Wildlife Service Vet Dr. Njoroge, who heads the DSWT/KWS Amboseli Mobile Veterinary Unit. Rescued at just a few days old, he is now safely in the care of our Elephant Orphanage but for our elephant keepers, feeding Kili is providing a little more difficult than the orphan elephants they're used to! For one thing, adult males grow to 5.5 meters (over 18 feet) in height and despite Kili being just days old, our keepers need to clamber high up on the stockade partitions in order to get the bottle at the appropriate angle so that it feels natural for him. 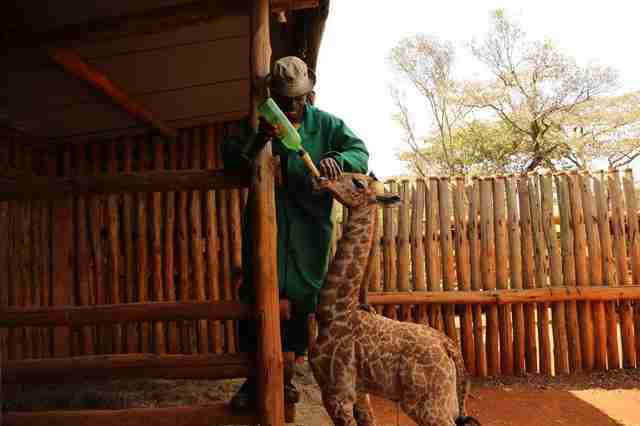 We're currently making a special mobile feeding ladder as he's going to continue to grow even taller! In the wild, baby giraffes endure a particularly rude welcome into the world by falling more than 1.5 meters (5 feet) to the ground at birth. 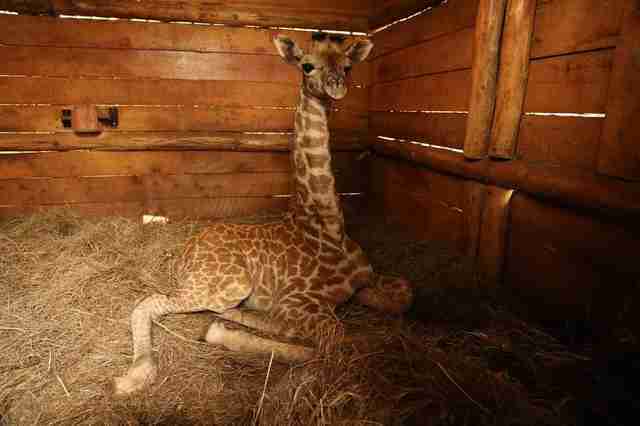 These infants can stand in half an hour and run with their mothers an incredible ten hours after birth. Alone, young giraffes are very vulnerable and cannot protect themselves from predators though when older they can deliver a strong kick to any predator. 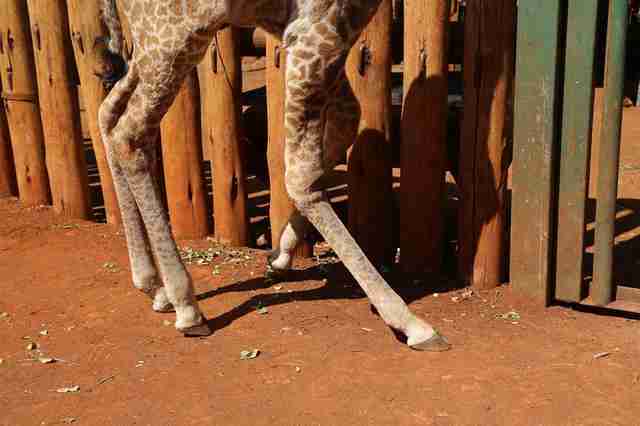 Kili however has a little way off until he can survive alone and back in the wild as he as has issues with his front knees, with stretched tendons making these appear double jointed. We're hopeful that this will correct in time and that when older, Kili will be reintegrated back into the wild. While young, Kili will grow tall pretty quick and as he matures, his coat and unique spots will darken with age. In fact a male giraffe's coat does not just indicate his age, but also his subspecies - there are nine in total. As one of Africa's more unusual mammals, all giraffe across Africa have been severely affected by illegal hunting, increasing competition with humans for land and resources and ever present human-wildlife conflicts which has led to their 30 percent decrease in numbers over the past decade. The David Sheldrick Wildlife Trust is currently providing specialist care and milk to Kili until he is grown. Find out about some of the other orphaned animals we care for here and for updates on Kili's progress, visit our Facebook page.